Please do not misinterpret this title or our position. We know that millions of patients every day get the right diagnosis and/or treatment from their personal physicians. But we also know, based on research and testimonials, that some patients do get the wrong diagnosis and/or treatment. In many of these cases, both the doctor and the patient likely made a bad decision. Thus, we are “Pro-Evidence” and “Anti-Bad Decisions.” The mission of SMTE is to teach patients how they can and should use real evidence (with their doctor) to identify the best treatment for their unique condition. That all being said, what I want to talk about now is 5 reasons why patients (such as yourself) may not always get the best care available. Reason 1: Outdated Information. Depending on when your doctor attended medical school or residency, it is possible that some of their instincts, prescriptions, and techniques are now outdated or inappropriate. Thousands of new studies are published every year, and thousands of older studies are still relevant. Evidence is growing exponentially and it is impossible to keep up with everything. A young doctor may not have the experience and range of knowledge that an older doctor does, and an older doctor might be set in their ways and less open to new ideas (I’ve experienced the latter.) It would be impossible for a doctor to know ALL of the medical information out there, which is important to keep in mind. Your doctor doesn’t know everything. How do you get your doctor to be “Up To Date?” This is where evidence comes in. 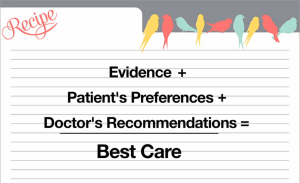 Evidence is the actual outcome data that come from patients who are just like you. Evidence enables both patients and doctors to determine which test or treatment is best for their unique medical condition. 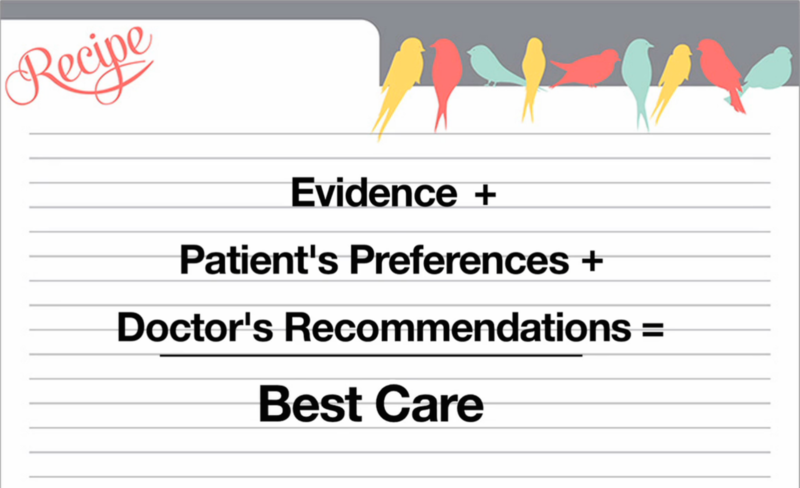 It is nearly impossible to make a truly informed decision without reviewing the relevant evidence with your doctor. Reason 2: Defensive Medicine. This is when doctors order unnecessary tests and treatments to stay out of court. We talk more about this in another blog so I won’t get into details here. Read about Defensive Medicine and it’s effect on your health care and your wallet! Reason 4: Specialist Recommendation. This one is simple. If you see a surgeon, they are going to recommend surgery. If you see a radiation oncologist, they are going to recommend radiation. How do you make sure that you are getting the best treatment recommendation as opposed to their “favorite” recommendation? Look at the evidence to see which is the most effective treatment for you before succumbing to a Specialists’ recommendation. Lastly is Instinct. Depending on your doctor’s experiences they will be recommending treatments to you based on their instinct. Which might be spot on! But it may not…. Why take the chance? SHOW ME THE EVIDENCE! Here is an excerpt from our “Documercial” which sums up what you’ve just read.